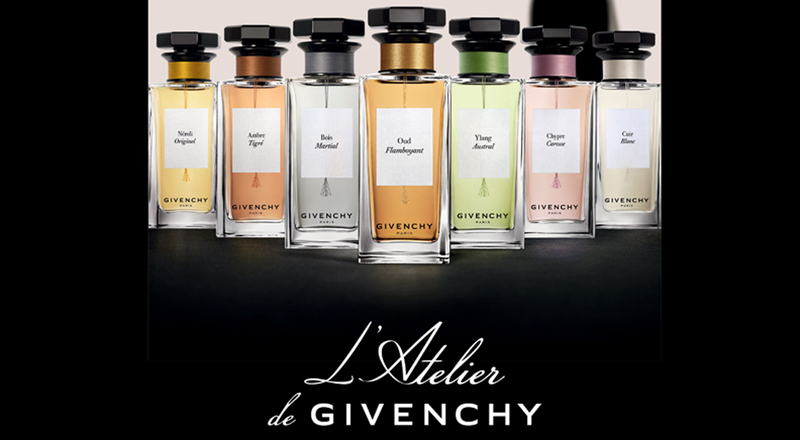 Haute Couture and fine perfumery come together in a perfect union in the new collection of 7 fragrances entitled L’Atelier de Givenchy. From the passionate sensuality of Givenchy’s celebrated creations to its iconic muse Audrey Hepburn, the new line draws inspiration from the couture heritage of the House. The perfume lineup evokes the feel of the House’s sumptuous fabrics and showcases distinctive character that appeals to both men and women. The names of the perfumes combine the primary elements used to create the scents and reference their high fashion origins. Each fragrance is accompanied by a couture sketch. The collection includes: Néroli Originel, the fragrance inspired by a dress worn by Hubert de Givenchy’s muse Audrey Hepburn; Cuir Blanc, which combines the notes of white pepper, white musk and leather and reflects the historic connection between perfumery and glove-making; Bois Martial –inspired by Givenchy’s geometric cuts and androgynous looks, the fragrance includes notes of cedar wood, pineapple sage and coconut wood, an element rarely used in perfumery; fresh and delicate Chypre Caresse; woody floral Ylang Austral; strong and mysterious Oud Flamboyant and passionate and magnetic Ambre Tigré.